by Sharyn Caudell, Durham’s “Gardener-to-Go”. We’ve had some dreadful weeks of very high heat and no rain. In a two-day period, we went from mid-May temperatures and regular rain to late-August record temperatures and no rain. What little moisture was in the soil evaporated quickly. Pouring water on the garden helps, but only to a certain extent. If you have a drip irrigation system, you are in the best shape. I don’t, and there is only so much you can do with a hose and sprinkler. I’ve lost two shrubs, several perennials, and given up on most of the vegetable garden until fall. Take a hard look at your garden now. If there are areas that simply never look good in high heat, plan to replace plants and re-do those areas in the fall (its the best time to plant perennials, shrubs and trees in the South). Yes, you can continue to water faithfully (and maybe daily), but sooner or later, the plants will probably give up trying to grow. My main front flower bed has suffered these last few summers and now, as I look at the ‘crispy critters’ out there, re-doing the bed is necessary. I have to design a garden and reuse existing plants for the toughest client I’ve ever worked with: me. Most gardens are looking beat and tired by now. There are two plants that I have had great success with for summer color: Wave petunias and zinnias. With our past mild winter, my Wave petunias overwintered under a small amount of mulch. One section is now 8 ft x 6 ft! These bloom until frost. 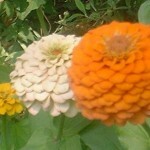 Zinnias do better in high heat than marigolds (and either you love or hate the smell of marigolds!) 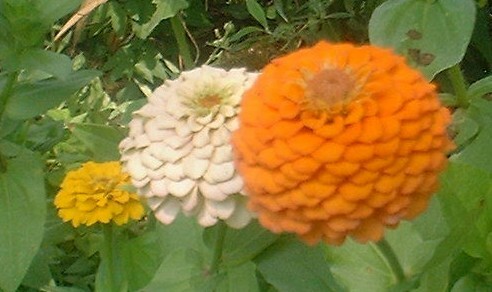 There are two lovely low-growing zinnias for a ground cover, Zinnia linearis and Zinnia angustifolia. This one doesn’t really start to grow until the temperatures climb. You can find it in white, orange and yellow. If you have good drainage, you can use Mediterranean plants such as lavenders, rosemary and the like. It doesn’t rain in the Mediterranean during the summer, so these plants can take our heat – but they need good drainage to survive our humidity. Plants with silver or gray leaves, especially fuzzy leaves, do well in high heat. Think of plants such as lamb’s ears or artemisa in your sunny areas. In shady areas, sacred lily and hardy cyclamen do well in dry areas. Take a look at your garden and see the future of our summers to come. We must plan for high heat and no rain in the summer. This is the pattern of the last 7-10 years and it’s our new gardening reality. Note from Jon: Sharyn Caudell owns “Gardener-to-go”, which focuses on helping people plan their gardens. Check out her website at http://www.durhamgardenertogo.com for more information.